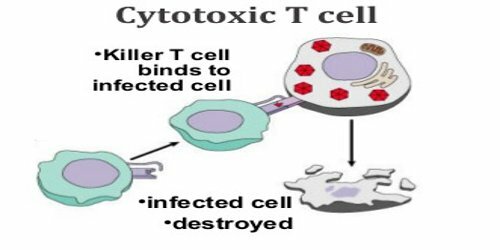 Cytotoxic T cell is a type of immune cell that can kill certain cells, including foreign cells, cancer cells, and cells infected with a virus. It can be separated from other blood cells, grown in the laboratory, and then given to a patient to kill cancer cells. A cytotoxic T cell is a type of white blood cell and a type of lymphocyte. 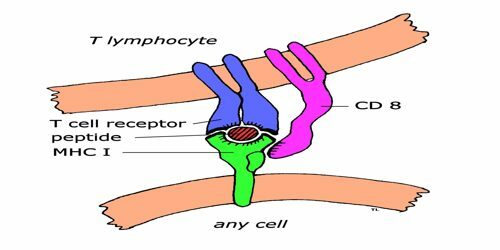 It is also known as TC, cytotoxic T lymphocyte, CTL, T-killer cell, cytolytic T cell, CD8+ T-cell or killer T cell. Most cytotoxic T cells express T-cell receptors (TCRs) that can recognize a specific antigen. An antigen is a molecule capable of stimulating an immune response, and is often produced by cancer cells or viruses. 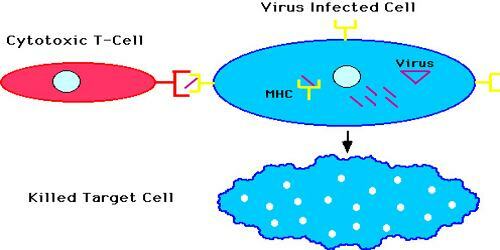 Antigens inside a cell are bound to class I MHC molecules, and brought to the surface of the cell by the class I MHC molecule, where they can be recognized by the T cell. When cytotoxic T-lymphocytes (CTLs) find cells carrying the viral peptide they are looking for, they induce these cells to secrete proteins that attract nearby macrophages (a type of white blood cells). These macrophages then surround and destroy the infected cells. CTLs are important in the body’s response to viruses and cancer. The immune system is a complex arrangement of cells and molecules that preserve the integrity of the organism by elimination of all elements judged dangerous. Within the immune system, a humoral and a cellular as well as an innate and an adaptive arm can be differentiated. TCRs have two parts, usually an alpha and a beta chain. The vast majority of T cells express alpha-beta TCRs (αβ T cells), but some T cells in epithelial tissues (like the gut) express gamma-delta TCRs (γδ T cells), which recognize non-protein antigens. Cytotoxicity is exerted directly through the Fas or perforin pathway and/or indirectly by the release of cytokines. Obviously, the activity of such a potent cell is tightly regulated. Indeed, a predominance of stimulatory over inhibitory signals is required for effective immune responses to pathogens, and a predominance of inhibitory over stimulatory signals is required for maintenance of self-tolerance. Still, several situations occur in which an inappropriate CTL response leads to either autoimmune disease or persistence of pathogens. 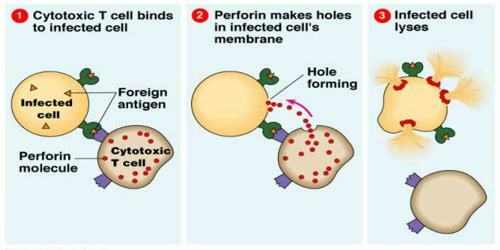 T cell receptors always recognize peptide antigens presented on MHC molecules on the surface of other cells. Despite these common features, T cells perform several, quite different functions in the body. They are first divided into two populations based on whether they have CD4 molecules or CD8 molecules. The activation of cytotoxic T cells is dependent on several simultaneous interactions between molecules expressed on the surface of the T cell and molecules on the surface of the antigen-presenting cell (APC).